Lunchrestaurant Kanan is one of my personal favourites. In the village of Kainan right in the middle of Ishigaki island, in between houses and pineapple fields, lies lunch restaurant Kanan. It’s not easy to find, which I think is an advantage. The Japanese cooking here is influenced by the Yaeyama cuisine. Healthy food. All ingredients are fresh, the dishes tasty. Kanan serves a few lunch plates. Most of the small dishes on the lunch plate are without meat, some with fish. 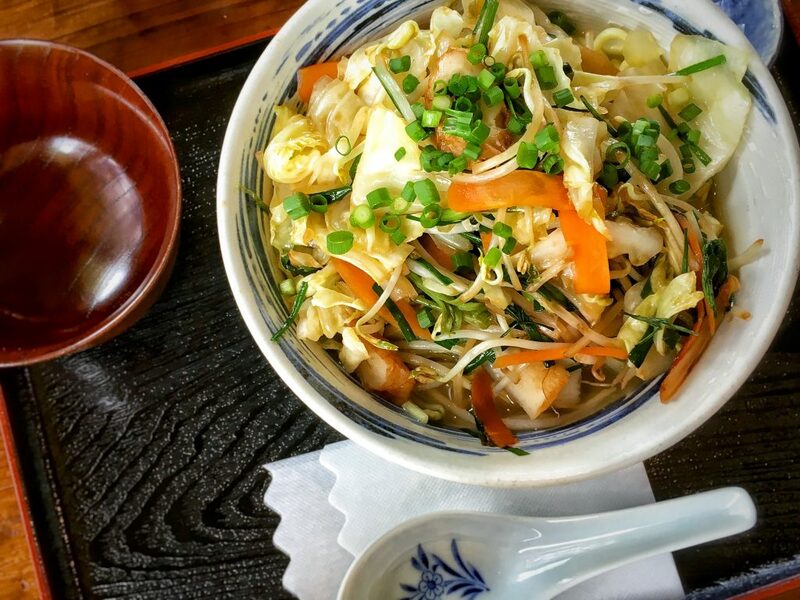 Some bowls are a mix of meat and vegetables (small amounts of meat). And of course miso soup and rice. It’s no problem to ask for an extra bowl of rice in Japan or to ask if the ladies can keep out the meat for you. Lotus, tsukemono of ginger and carrot with daikon (a kind of radish). Tsukemono means ‘pickled things’ or in a direct translation ‘soaked things’. Carrot delicately cut in the shape of the sakura flower (which has 5 petals. You’ll never see carrots with 4 petals, it’s said to bring bad luck), kiriboshi daikon (sliced and dried daikon) and peanut tofu. 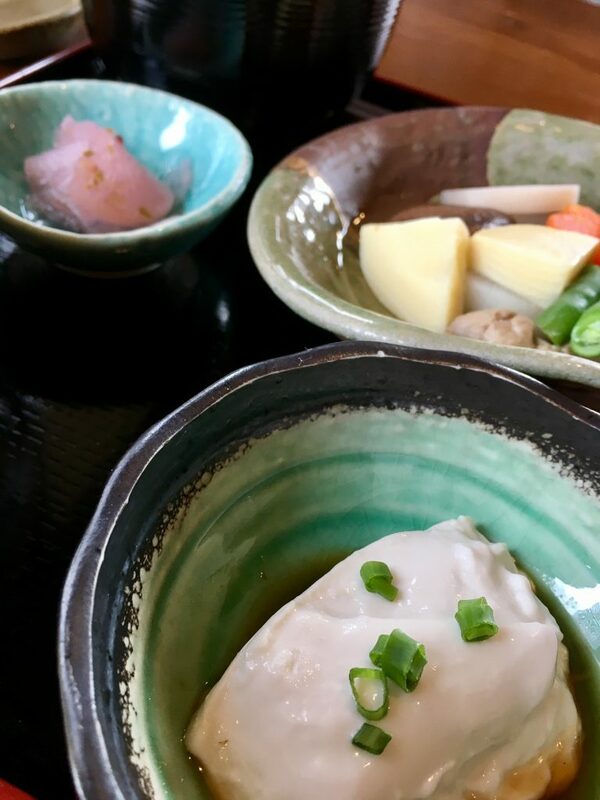 Jimami tofu is a typical Okinawa dish, made from peanuts. Slightly sweet with a dressing of soy, mirin (ricewine), sugar and a spring onion topping. Jimami tofu differs from the tofu made of soy beans. It’s creamy and sweeter. Breakfast, lunch or dinner is called ‘gohan’ in Japan. It means ‘rice’. Together with miso soup (made of fermented soy beans), rice is the main part of the Japanese meal. 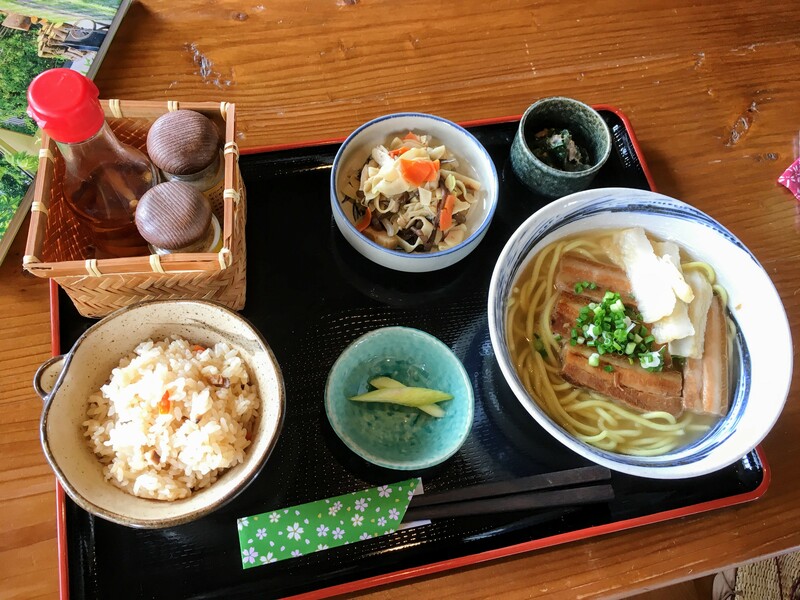 For example, if you order a Yaeyama Soba lunch plate, soup with noodles, rice is served as well. Rice is very important in Japan and has a deep meaning. Japanese people treat their ingredients always with care and respect. No rice grain is spoiled. 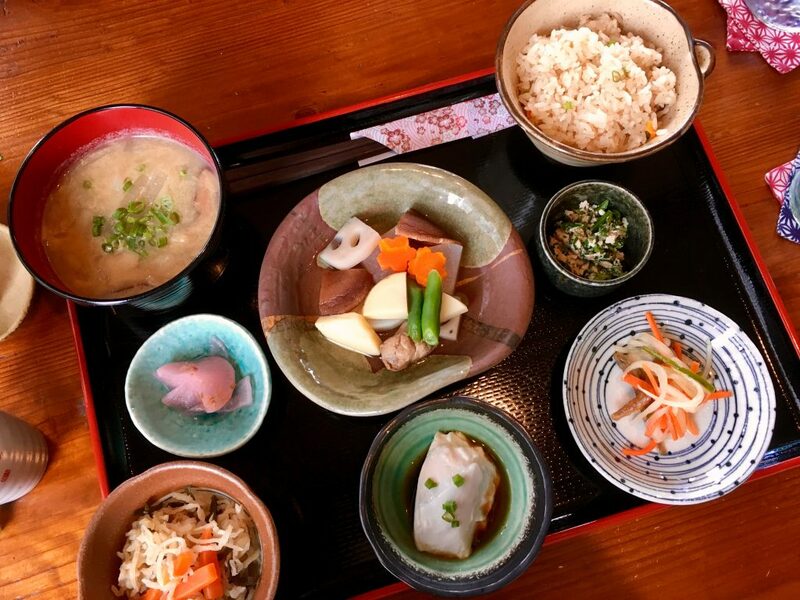 Kanan is only open for lunch and is located quit far from the city center. If you’re exploring Ishigaki island, this is a good spot to go. The Kanan ladies love gardening. With the devastating typhoon season here, it’s noteworthy how well their garden is taken care of. 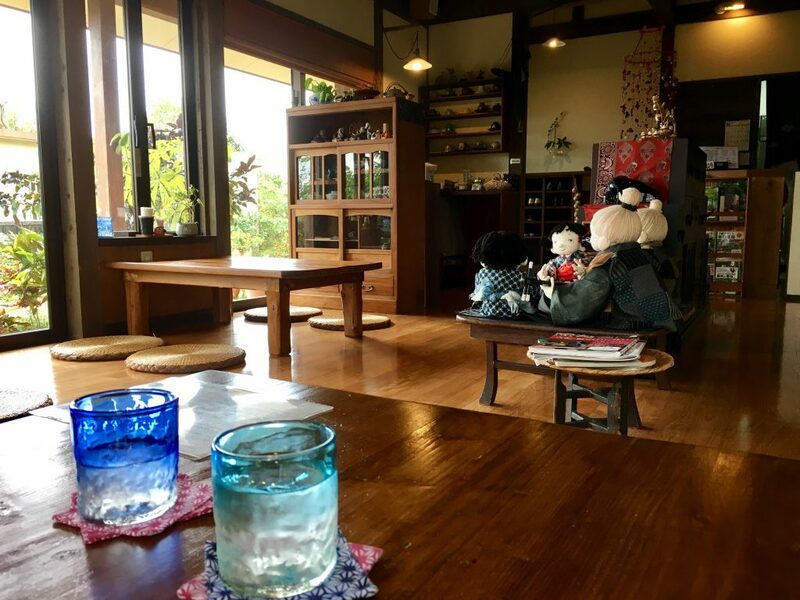 The interior is cozy and ‘craftsy’, a mix of Japan and the Yaeyama islands. In a small corner of the house you can serve yourself a coffee, tea or water.